Balastor's Barracks - Travel into the old ruins of Pavis to recover the weapon of a fallen hero. Creatures of Chaos - A statted list of broo, scorpionmen, and other chaos horrors to throw at your players. Militia & Mercenaries - Friends or foes? Use these statted characters in your RuneQuest campaign. Trolls and Trollkin - Choose from the list of dangerous Uz and sneakly Enlo stats to bring into your game. 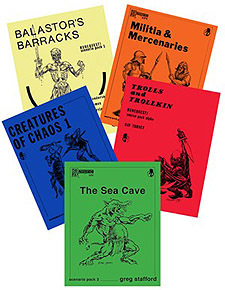 The Sea Cave - A never-before-released adventure written by Greg Stafford himself.